Google has always been on an app spree launching new ones while closing old apps that people probably never heard about. Google Meet is much like Hangouts but it has been designed for Enterprises and has specific business-like features. 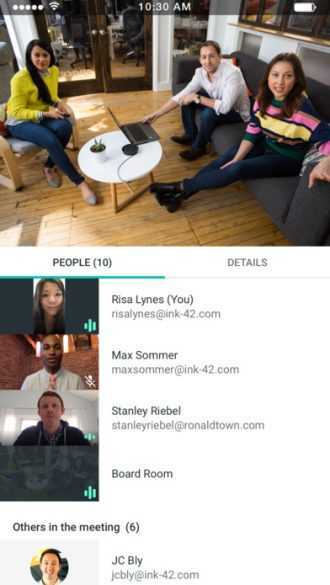 Named as “Meet by Google Hangouts”, the app allows seamless high definition video calling between a whole lot of people, 30 of them if we are to go by the information on the site. The app got rolled out earlier than expected because its features are not listed on the G Suite. It should be up and running soon so that enterprise users can make use of the exclusive features it offers. The link leads to an error page but many of the upcoming features are already available online. The overall design and user interface of Meet resembles Hangouts. As the name suggests, it uses all the UI and codes from the consumer version of the app. The developers have tweaked it in some ways to make it business friendly. The screenshot shows a scenic backdrop with a Calendar and a Clock widget on it. Such minor but useful add-ons help a lot to schedule meeting, know the schedule of other people and obviously a clock on top ensures your meetings don’t get prolonged. While Hangouts is pretty much simple on its own, the new Google Meet has been further simplified allowing employees to join a meeting with the click of a button. You have to use a meeting code to join a conference. The limited information available didn’t discuss how one could host a meet. The iOS version of the app got leaked on the app store for a short period within which a popular technology website TechCrunch managed to grab a screenshot. A big, green button with the words “Join a Meeting” was spotted in the screenshot which users have to click to join a conference. The dial-in numbers will be exclusive to G Suite Enterprise Edition users who pay to use the services. Google has been launching one app after the other out of which Hangouts have found a strong position as it replaced Gtalk. The newly launched Allo is yet to be widely adopted and has been going on a lukewarm phase so far. The newly launched Google Meet for Enterprise users could however be a strong addition because it is being used by paid users and the company already has a large user base around the globe who are subscribed to G Suite.